This Saturday, I reset up the Hougoumont Scenario that the Boston Trained Bands put on at Huzzah three weeks ago. I did not get a chance to play then so was quite keen to have a go. The club uses the Black Powder rules for Napoleonic wargaming. Not my favourite set, but certainly a good set for an asymmetric scenario like Hougoumont. Few rules sets allow for 4 different sized units, but to recreate this battle with multiple single companies coming on at different times, I have to say they worked very well. One other thing I like about BP is that the movement rules are quite simple. I less like the fact that the combat and firing mechanisms are not related to the number of bases but rather to several (4) intrinsic stats for each unit. I have to admit I also like stand removal. But I should not be too critical, as I have to say I really had an enjoyable game. We played the scenario as written in the Albion Triumphant (a title which drives my French friends crazy) supplement, with one minor change. The scenario only allows one tiny unit within the wall of the chateau complex. The footprint of the model we used was much larger than described in the supplement, so we allowed 2 units in the chateau and two in the walled formal garden. It was a 12 turn game with a French brigade (21 battalions in total) coming on in turns 1, 3, 4 and 6 while the Allies had the equivalent of around 3 1/2 battalions dribbled in over the same period. The French arrive anywhere on the southern edge while the Allied companies arrive in either the compound, the garden, the orchard or the kitchen garden. The Allies have one advantage and it is significant, the British Guards make up 2/3 of this force. They are fearsome! The Allies also have 2 small brigades as reinforcements in Turn 10. There are also off table artillery firing each turn, 5 for the French and 2-6 for the British. No cavalry in the game. Four of us played, Rich and Steve split command of the Allies, while myself and Bill had 2 french Brigades each. Aside from myself all well well acquainted with the rules. The French have the first move. Lord Salton, the Allied commander with a another company of Naussers. The French légére face off against Hanoverians and a British Guard company in the woods. The Hanoverian jägers were quite brittle, but the Guards were pretty tough. The French push through the wood into the killing ground. Turn 4, Tissot's 4 battalions of ligne, by now though Baudins's Brigade has suffered morale failure and is withdrawing from the combat. Jerome keeps on feeding in the troops. Jamin's Brigade joins the fight. We are now at Turn 9: 3 of the 4 French Brigades are withdrawing. Jamin's battalions enter the compound but his brigade now has more then half their units shaken and withdraw. An Allied victory, a historic result, a good game. Great report and wonderful looking game! Great looking game and excellent model of the chateau. I think the smaller scale model works well. That's what a wargame should look like, Splendid! Someday I have to give this a try. Your and I are on the same page about Black Powder but I must say I always enjoy the game even while I don't especially like the rules. Stunning looking game and the result was how or test game went. I have to agree Ian. 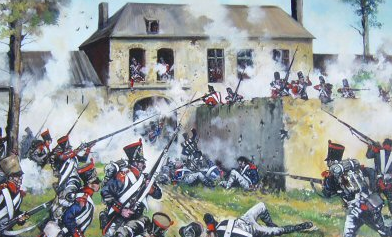 in Black Powder every unit seems to be the Guards holding the Hougoumont. It was tough, as I thought we played ok. Excellent report and great pictures, this terrain is amazing! Wonderful report John! The game looked stunning and seemed to provide some fun for the players. Yes we had a nice game, I am trying to convert it to GBCoC now, we will see how it goes. Looks great and sounds like everyone had a ball. Well done to all involved. Thank you, you have quite a nice web site yourself. Great game and an interesting report.